These are just general guidelines; they will vary depending on the individual (i.e. whether the person is competing, just starting at the club, injured, etc.) and time of year (i.e. close to a competition, long before a competition, after a competition, before a demo, etc.). This is only meant to be a loose guide and coaches should follow their own best judgment. Monday: Emphasis on barehand and weapons basics/combos as well as some conditioning. Wednesday: Focusing on forms and nandu. Friday: Primarily a learning day for new forms/combos. Saturday: Focusing on forms that student is especially working on. Conditioning at the end of practice! A guide to the Terpwushu curriculum for individual progression through forms can be downloaded here. This period is focused on the University Wushu Games at Maryland and preparing for this competition. 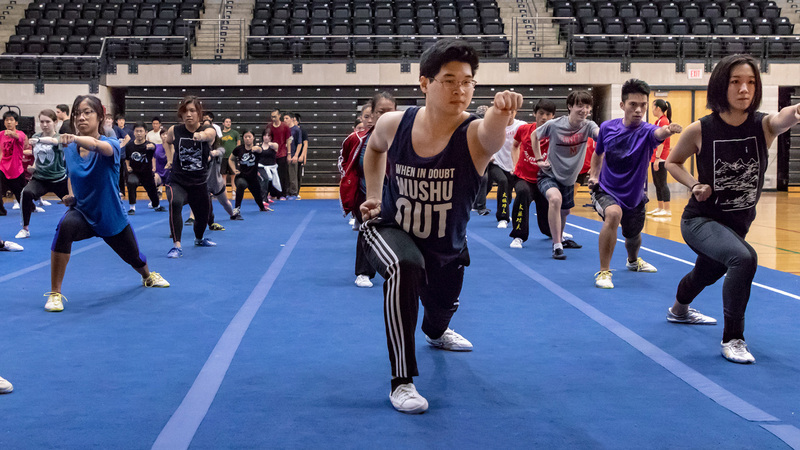 The goal of this period is to train for the National Wushu Collegiates. There are also many Lunar New Year Demos that members participate in. This period is similar to training for a competition (meaning this training is still intense) but we are also preparing for all of our demos. We have a number of demos, including APA1, TASA, Cultural Explosion, and the major one: our own TerpWushu End of Year Demo. This will be our own event, and every member will be a part of this. There is a heavy focus on reviewing basics, introducing challenging combos, working on nandu, and learning new forms. It is also potentially another competition period: Some options for the competition include the Capital Classics Wushu division, the USAWKF Nationals, and the Koushu Tournament in Baltimore. Quarter 2: Progress toward focusing more on forms, and increasing the intensity, duration, and volume of forms practice. This means go from practicing mostly 1-2 sections toward doing whole forms many times at a high intensity. Quarter 3: Highest intensity but lower volume. For examaple, do very intense and powerful sections and whole forms but don’t do too many forms/over-train. At this time find “peak performance”, or the conditions that bring about your best performance (how many days of rest, what kind of foods, how much practice, etc.) This period is right before competition (about 2 weeks) and should include a lot of rest (not practicing everyday). Quarter 4: Decrease intensity, focus on correcting mistakes made during competition, thinking about competition experience, and start to learn new things.